Give the flow some context. 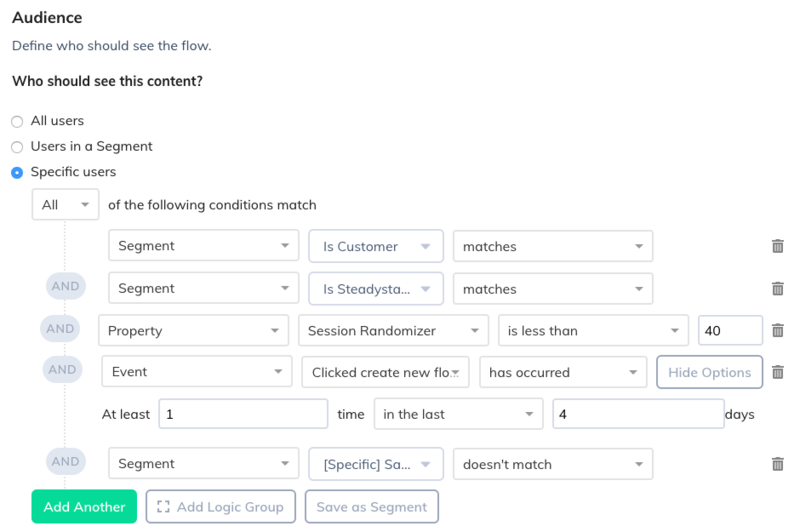 Because we have event targeting we are able to say "Looks like you recently built a flow", and you can give short context in the same way. 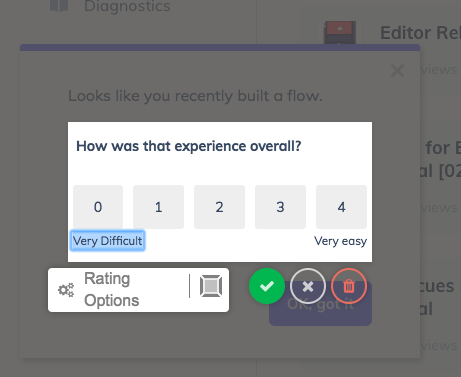 This will contain both the question you want to ask the user as well as the numerical rating block. 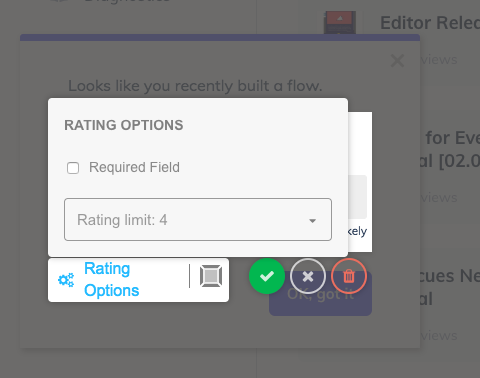 Set the numerical limit to your preference and add a label. You can also edit the rating text under the numbers. 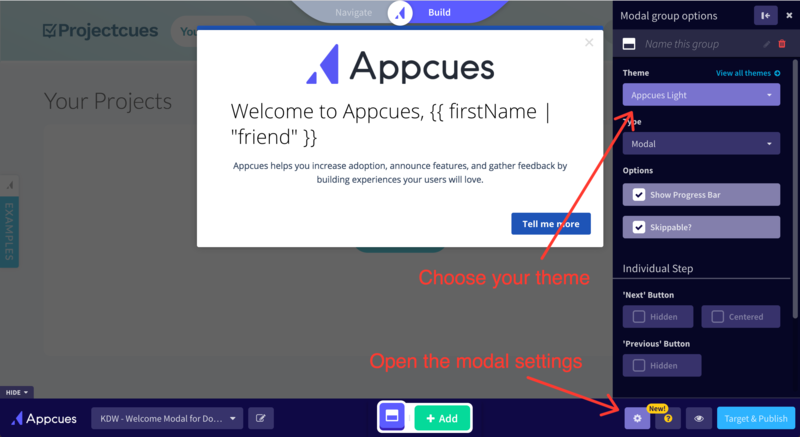 See the Themes page if you haven't already set a theme for your Appcues content. To be able to target you'll need the applicable User Properties being sent to Appcues. 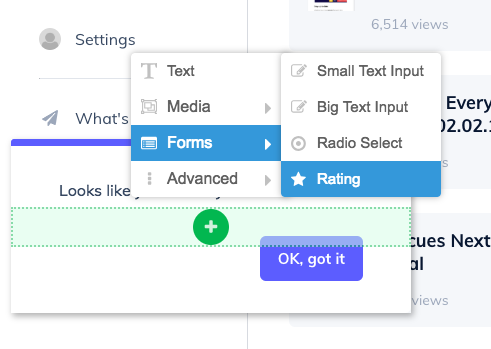 You can see what you're sending on the "Events and Properties" tab of the Settings section. And recommended User Properties to send are in the User Properties Overview doc. The targeting below is for example purposes, yours will be different. For this flow, we wanted to target a very specific set of people. First and second, we used our Segments for Customers and Steadystate users ( creating a Segment). Third is the Session Randomizer property, which each user gets during each session and it changes with each new session. It's on a 100-point scale, so we're trying to target about 40% of users that meet all the other criteria. 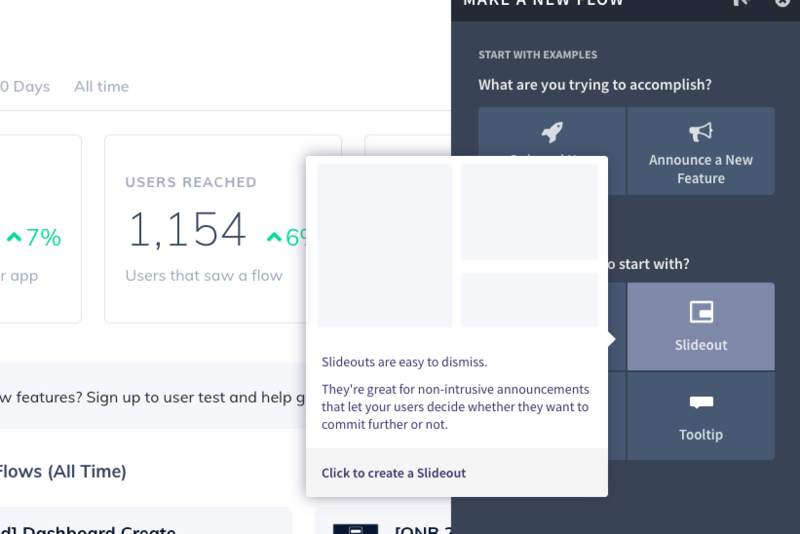 Fourth, we'll show this flow if the user has "Clicked create new flow" in the past 4 days. 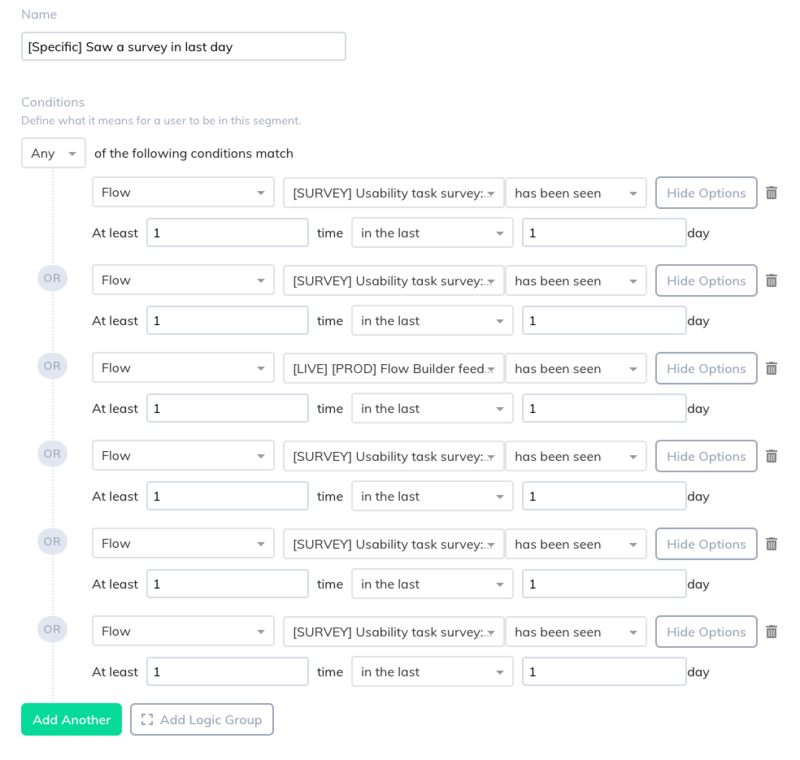 This is an event we send to Appcues from a button click in our application and is how we know the did the activity we're asking about. 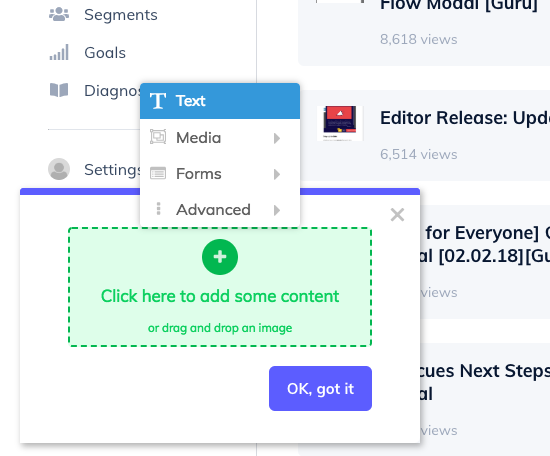 When you're ready you can use Test Mode to see what your modal will look like and publish your flow when you're ready. 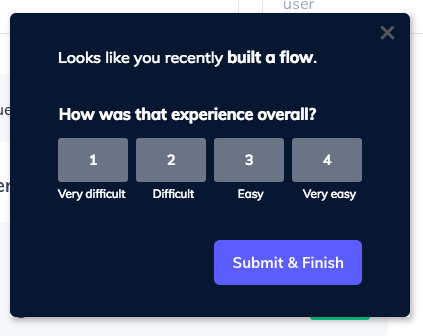 And remember, you don't need to wait to build all the content you're hoping to build to set this flow live; and you can always iterate on each flow once you know how your users are interacting with them. Have an awesome feedback form or survey to share? Need some extra support? Shoot us an email at support@appcues.com and we'll be happy to help.